Success of a child care centre is dependent on staff put in place, regardless of the money spent on equipment and materials. The staff will speak of quality. Playschool has become the new essential requirement in the first steps of education of the children/toddlers. Most of the kindergarten schools require a playschool certificate to give admission to children in their schools. Thus a playschool business is mushrooming and guarantee success if certain steps are followed diligently. In today’s time, as both the parents are working, the demand for day care facilities is growing and is expected to increase at a higher pace in near future. A CRISIL research indicates that the playschool market would grow at a CAGR of 20.6% to reach Rs 133 billion by FY15 from Rs 43 billion in FY10. It also indicates the share of organised players to increase to 34% by FY16 from 11% in FY10 on the back of the rising awareness about quality playschool education, big expansion plans of existing players and the entry of more organised players in the playschool segment. As more playschools will be seen paving their way in the education sector, here are a few points which ought to be considered to make your venture a huge success. Location can make or break a business. So, a thorough market survey should be conducted. The location should ensure ease of reach, availability of human resource, should favorably be on a ground floor and in a residential area to maximize its reach. A competition analysis should also be done before proceeding with the property agreement. NOC from society is also advisable. Many considerations, both indoor and outdoor, need to be addressed when designing the facility. There should be at least 1500 square feet (approx) of unencumbered space for play area. The premises should be child safe. Indoor space should be carefully planned as well with at least 25 square feet of space per child. Child-proof furniture, access to restrooms, fire & safety measures should be well taken care of. Success of a child care centre or a playschool is dependent on staff put in place, regardless of the money spent on equipment and materials. The staff will speak of quality. Human resource hired and deployed should be gentle, friendly and patient. Parents look forward to a safe, competent, facility with a well rounded curriculum. The centre and its staff, if properly hired, contribute in a positive word of mouth. 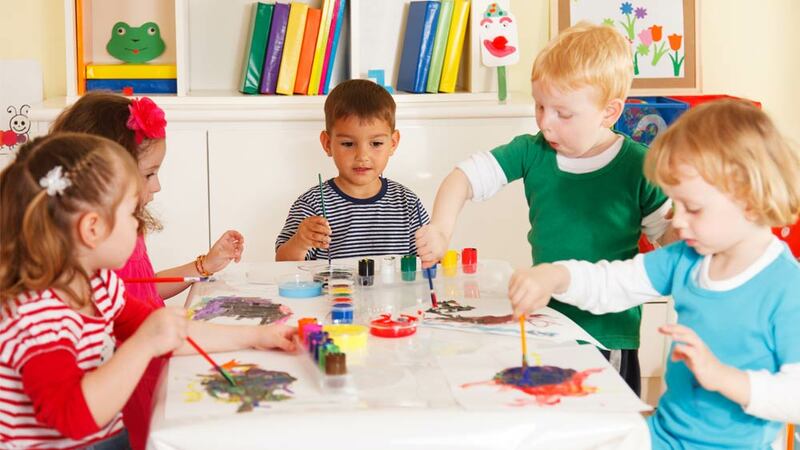 When starting a playschool, furniture & fixtures, colourful tables and chairs as well as colours to maintain continuity and standardisation should be purchased / rented. Make sure to have child specific & appropriate storage for learning. Deciding on what stuff & materials to use to make classrooms look aesthetically peppy is the fun element of opening a playschool. Place learning/teaching aids in the activity room that promote literacy, problem solving and thinking. These teaching aids should contain areas for art, dramatic play, reading/library, science and discovery, music and movement, sand and water play, Montessori materials etc. Conduct a research of the income of families staying in the particular location where you intend to open your playschool. Ideally, a competitive fee and good facilities would bring in more children and help spread the word-of-mouth. If you are caring for little ones, you will need to ensure that you have sufficient liability insurance in place for your business location (whether it is your home or elsewhere). Your insurance agent or broker will be able to advise you about the appropriate level of coverage for your needs. The challenge about playschool is to work out on the things that makes learning fun for children, keeps them happy and simultaneously maintain the quality. Looking into the points stated above would ensure the success of your playschool a long way. Wishing you all the very best!